Two-story, two decks, two bedrooms with extraordinary views. 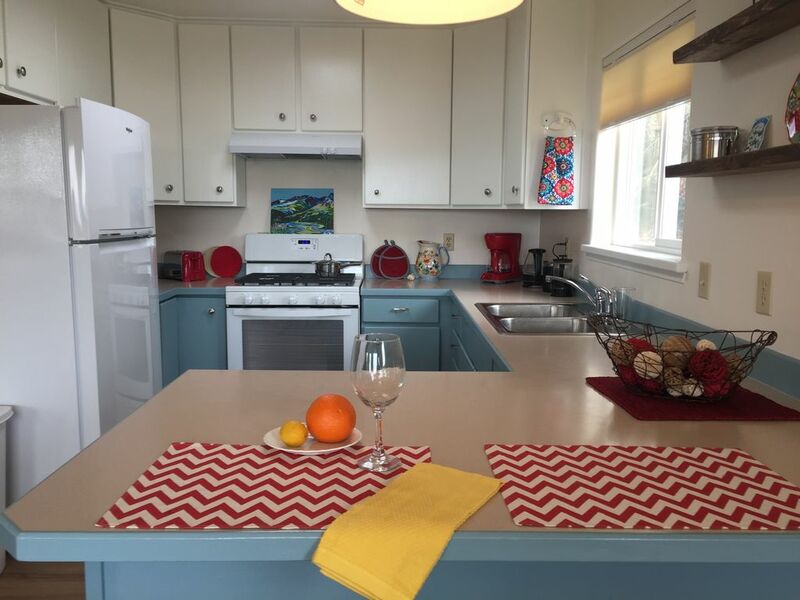 New to the nightly rental market this year, this darling little house has been completely renovated in a rather eclectic Alaskan style. We have combined some of old Alaska with fresh looks for an utterly charming effect. Please note that the bedrooms in this house are upstairs while the bathroom is on the first floor. Located conveniently close to town, on the back corner of the property, you have a private yard, plenty of parking, and spectacular views of Kachemak Bay and the snow-capped Kenai Mountain Range. There are decks across the width of the house on both levels. South-facing, the house and decks capture the full sun into the evening hours. Both decks have seating from which to relax, drink coffee (or whatever!) and take in the extraordinary views. I was born and raised in Homer, my husband, Kit is from Scotland. While I have never moved away from Homer, I have done considerable travel. Kit and I have chosen (in my case re-chosen) Homer for our own love of hiking, fishing, camping, and boating. Previously we worked in Bush Alaska during the school year, I was a high school English teacher, Kit has worked as a VPSO (Village Public Safety Officer), alcohol distribution agent, and school bus driver, then Maintenance & Operations for the school. We are now living in Homer full time and loving it! This house has a bit of family history. My brother build it in 1991 when his family was young and growing. He commercially fished both Bristol Bay, Alaska (red salmon) and San Clemente, California (lobster). Most of the year he and his family lived in San Clemente, but spent a month or so on either side of the Bristol Bay season in Homer - where they visited family and prepared for the summer season in the Bay. They had outgrown our mother's house for such long stays, so he and I made the agreement that he would build a small cabin on the edge of my property for their use when they were in town and for my use as a summer rental when they weren't. Construction started as I took off for a month long moose hunting trip. Imagine my surprise when I returned to find this two-story 24 X 24 house with double decks! After some "water under the bridge" and a few years later, Kit and I purchased the house from my brother. This home is utterly delightful. It is filled with natural light, and views that are so striking they take your breath away. The octagonal window at the top of the staircase lets in a flood of sunlight each morning and provides a picture perfect framing of Yukon Island from the east bedroom. The house itself faces south and catches all the light available summer and winter. The bedrooms are both furnished with black-out blinds just in case you do want to shut your eyes and sleep. Bathroom is on the first floor, bedroom are on the second. Flour, sugar, salt, oil, select spices: salt, pepper, basil, thyme, bay leaves, oregano, rosemary. dishes, cups, glasses, flatware, serving/mixing bowls, spatulas, mixing spoons, knives. Table and seating for four. There are three flights of stairs up to and in the house. My husband and recently stayed at this cute house and we were both pleasantly surprised. The location and views were lovely and the house was awesome! It is the cleanest VRBO I have ever stayed in, had everything you needed to be comfortable and the beds were amazing. We will definitely be staying there again when we come up to visit family! We had a great stay at Fern Creek! We were in Homer for our sons state hockey tournament. Fern Creek worked out perfectly for us. It had room for the whole family and had a great kitchen for fixing meals. They even adjusted our check out time when our son made it to the championship game which was super helpful. I highly recommend this place! Loved the home - comfortable, clean, and had everything we needed. Great location for exploring Homer and beautiful views of the bay from the house! Beautiful views, perfect for a getaway! Beds were very comfortable and it was extremely affordable. Very nice and affordable place to stay in Homer.